As soon as my plane got close enough to touching the ground of San Juan, Puerto Rico, it was clear that the area was still dealing with the aftermath of Hurricane Maria that hit the island in September 2017. Even now, in June 2018, bright blue tarps still covered rooftops. What was placed as temporary fix after the storm still remained almost a full year later. These still-remaining temporary fixes were emblematic of the larger problem that Puerto Ricans faced after the hurricane; the feeling of not knowing what was going to happen next. By the time of my trip with the Program for Narrative and Documentary Practice, power had been restored to major metropolitan areas like San Juan, but in many rural areas, residents were still living without power. And just a month before our trip, the island had suffered another island-wide blackout. One photojournalist from San Juan said that he was happy that he lived in an area that had power but noted that occasionally the power would still shut off and his access to running water would be cut. 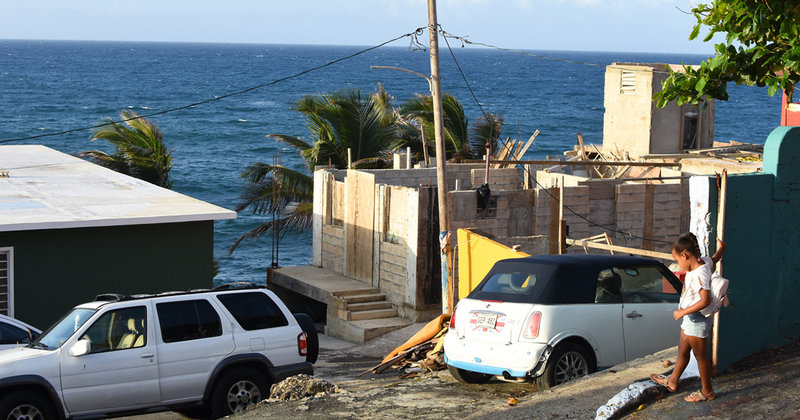 The unreliability of resources on the island is still a pervasive worry. In our own hostel, each room was equipped with numerous candles just in case the power went out. The Puerto Ricans that we met did not have much faith in the government providing the necessary resources to live their daily lives. This distrust in authority was enhanced during our trip when the news broke that the government's previous death toll estimates from the hurricane were grossly inaccurate. While the official death toll claimed 64 people had died during the storm, additional studies have concluded that the number is closer to 1,139 people with an additional estimated 4,000 dying due to lack of water, electricity and medical aid. Activists lined up pairs of shoes outside the capitol building in San Juan to represent the dead, while police officers stood outside to discourage any more protests. The hurricane also encouraged many Puerto Ricans to move to the mainland. An estimated 6,000 people reported address changes to the mainland post hurricane Maria. This rapid exodus of residents has caused local small businesses to suffer. One of the largest industries in Puerto Rico, tourism, has also suffered, despite many of the tourist destinations being almost completely rebuilt. Together, these have hurt the economy even more than the economic downturn the island faced before the hurricane. Talking to locals on the island, one thing has remained consistent: the local assemblies of community organizers. Many communities have banded together to create community centers, community gardens and child care centers. One organization that I spoke with, Brigada Puerta de Tierra, created their organization to get young people in their community interested in activism. They focus on small measures to help the community, like painting murals, planting medicinal plants and making bus stops more comfortable for elderly residents. Through the chaos of Hurricane Maria and the disorder of the government response, the diverse, local communities in Puerto Rico have remained a constant in helping their neighbors and looking to the future.